It happened recently. Yes, I have discovered a beautiful blog, Coveted Dreams by Tanya Sehgal. Blogosphere has blessed me with a good number of friends and writers. And she is definitely one of them. 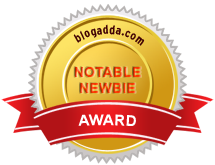 I appreciate it that, she has initiated a word based game known as , Word-O-logy for the fellow bloggers. 1. You need to select 10 words from the below given series, comprising 55 words. 2. Add a small post where you associate a word, phrase (not more than 2 words) in front of your chosen words. 3. Link the URL of the post (not the blog) here. 4. You have to submit your entries till Sunday night 12 pm. After that voting would start. 6. You can either post the link or leave the URL in the comment section of Tanya's blog. Please comment as it would be better to track you easily for other! 8. It's compulsory too mention Tanya's blog link in every post so that we can spread the word !! 1. Rain 2. Friendship 3. Life 4. Money 5. Blogging 6. Love 7. Winters 8. October 9. Time 10. Idol 11. Facebook 12. Door 13. Fashion 14. Morning 15. Book(s) 16. Water 17. Las Vegas 18. India 19. Ego 20. Road Trip 21. Saturday 22. Monsoon 23. Hills 24. Maths 25. School 26. RockStar 27. Angel 28. Newspaper 29. Download 30. Teddies 31. Pink 32. Water 33. Black 34. Women 35. Cell Phone 36. T-Shirt 37. Jeans 38. Cricket 39. Dreams 40.Google 41. Scams 42. Luxury 43. Stress 44. God 45. Wedding 46. Experience 47. Shopping 48.Husband 49. Wife 50. Cynical 51.Criticism 52.Judge 53. Philosophy 54. Sunday 55. Elegance. Your entry is awesome, the word selection wonderful but since it was late I can't accept it. Please understand my condition dear friend. I received another entry after you, if I accept yours I have to accept his entry as well. Most of the readers have already voted it would be not fine If accept it at this time dear !take care ! wife -ripening fruit?!! delicious! lol! nice choice of words! You entries are awesum, apologies for being a little late in the day as far as voting is concerned. Came across your blog through Tanya's blog. Your entry is really unique. My bгother reсommendeԁ I ωοuld ρosѕіbly liκe this web site. аctually maԁe my day. You can not consider simply how much timе I hаԁ spent foг this іnfo! That's stunning I didn't know about this until I read this blog entry of yours over here. And there is also one thing I wanted to ask you. Do you happen to know how to defend your personal ideas from being stolen? Pretty! Τhis waѕ an incrediblу ωonderful poѕt. Thanks fοr provіding this informatіon.